We are always on the lookout for new materials and new ways of doing things. We discovered the Modern Masters metallic paints a while ago and use them a lot in our work with good success. Recently I was on their website and discovered they also offer a line of theme paints. These paints are rich and pure in color and promise to be light fast for many years. As I perused their gallery of projects I saw many I had admired for years. Some very reputable companies use the paint with good success. I decided to give them a try. A selection of colors arrived to my studio while I was in Florida. I found them just inside my studio door and I couldn’t wait to give them a try. 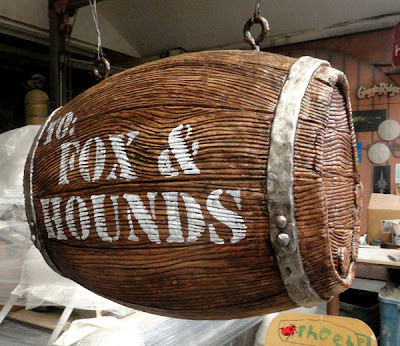 The barrel for the pub project would be the perfect project. The acrylic paint colors were rich and creamy, no noticeable odor when I opened it. This was no ordinary paint. I mixed up a light tan and put a base coat on the barrel. It covered well in one coat. I did two to make sure of longevity. Once dry it was time for some glazing. Where normally I mix the gazes 50/50, with the scenic colors it only took a tablespoon of brown to create the consistency of glaze I needed. It brushed on smooth and wiped off cleanly to reveal the texture beautifully. I then used some of the Modern Masters metallic silver to paint the barrel hoops. I allowed this to dry and then mixed up and applied one last glaze over the entire barrel. As it dried I prepared a transparency of the lettering. I projected it onto the side of the barrel and used some Modern Masters white scenic paint to brush on the lettering. I was looking for an aged look so I simply dry brushed on one quick coat. It looked beautiful in an instant – just the effect I was looking for.